Scientists use the term “uplands” to refer to lands outside of floodplains, and lands that are not aquatic or wetland habitats. Treeless alpine tundra is found at the highest elevations. 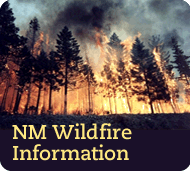 From higher to lower elevations, forests in New Mexico typically transition from mixed conifer and aspen, through spruce-fir forests to ponderosa pines or mixed pine-oak forests. In the lower, dryer foothills, pines give way to pinon and juniper woodlands. Forests and woodlands cover 28% of New Mexico’s landscape. Thirty-seven percent of New Mexico’s surface area is classified as grassland. Much of that is in the eastern plains, with the rest distributed between the non-forested parts of the northwest plateau, the central valleys, and southwestern bootheel. Shrub-scrub vegetation typical of the desert covers 18% of the state. Much of the southern borderlands are part of the Chihuahuan Desert, while the far southwestern corner of the state is in the Sonoran Desert. Intermediate zones dominated by shrubs are found between the mountains and grasslands, and between the grasslands and true desert.